I know, the code could be more efficient. ... and I move my LED to I6, I get no blink. I've tested all the pins and it doesn't seem like there is a signal coming from any of them. I assume that I am using the chip wrong, but I'm not sure how. Pictures of my setup follow... any help is greatly appreciated! 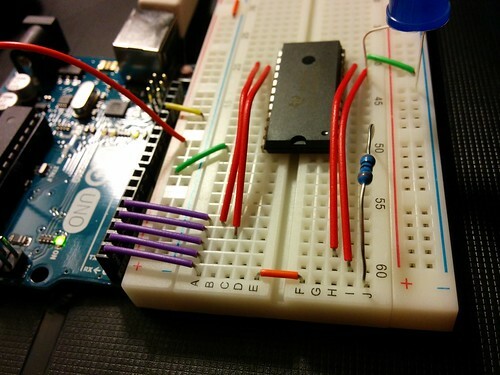 Arduino pin 0 maps to chip pin 1 (through resistor) as input. 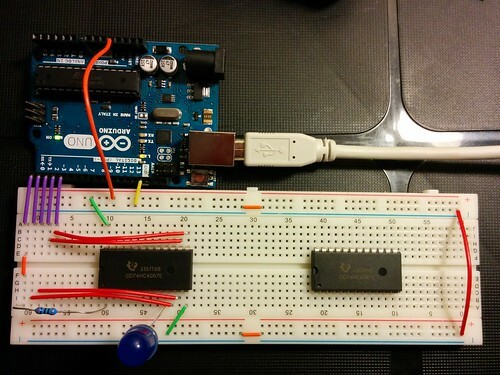 Arduino pins 1-4 map to chip pins 10, 11, 14, and 13 in that order. I have a 5V going to chip pin 24. The LED is connected long leg to chip pin 9 in the images, the grounded. Pin 15 on that MUX is the enable pin, you need to tie it to ground. Otherwise, it's just floating, and it only would have worked by accident. I am also providing 5V to the Vcc pin on the MUX. I don't really know why I am doing this, but it seems to work. The chip needs power to work. The Vcc pin is where you give it the +5V power. 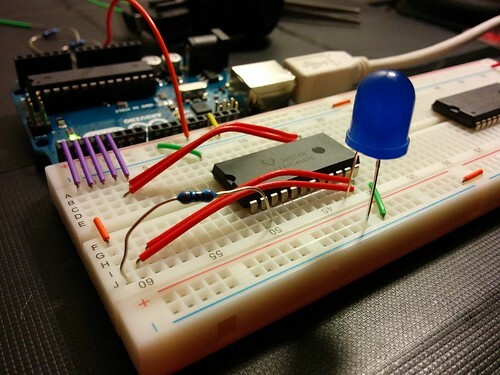 Without that, it might still work, but only by accident and depending on the inputs on the other pins.